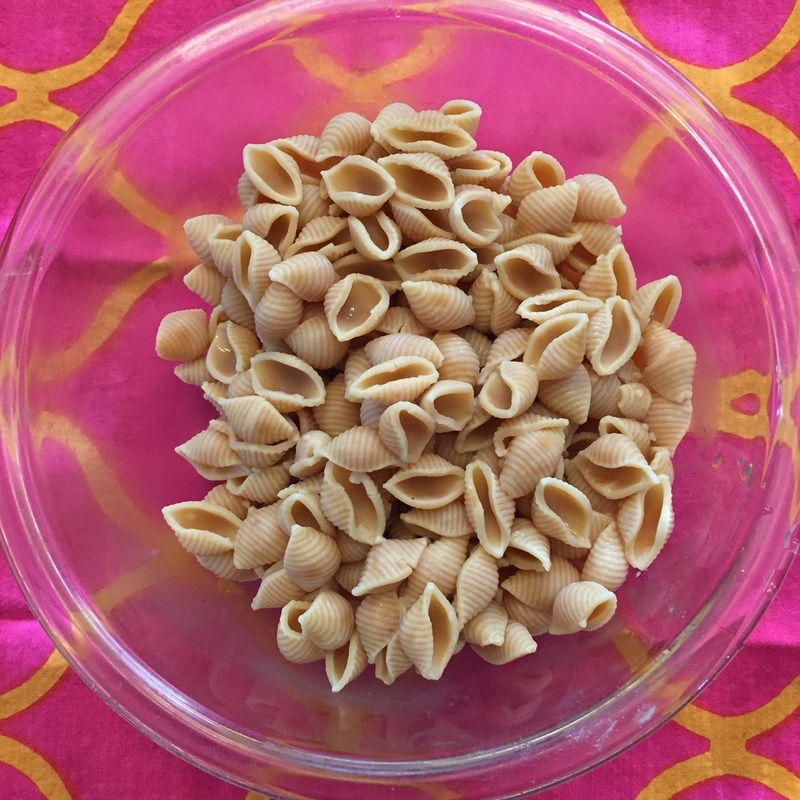 Today I'm making another pasta recipe using Banza chickpea pasta. 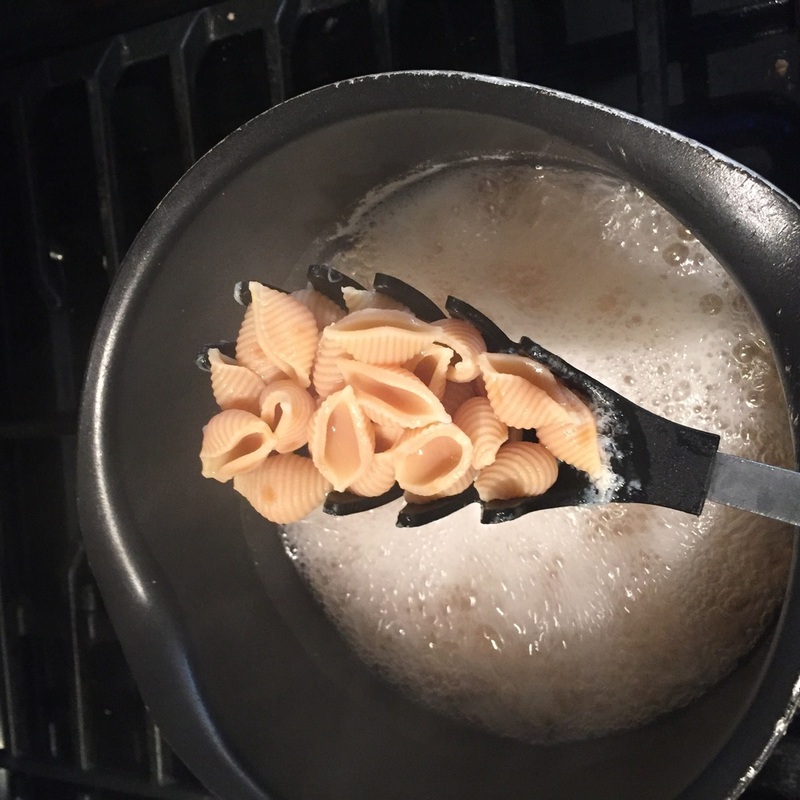 If you haven't been following my previous posts, here's a quick recap: Banza contains two times the protein, four times the fiber, and half the net carbs of traditional pasta. Banza is vegan, gluten-free, soy-free, nut-free and egg-free. Banza is made from chickpeas, tapioca, pea protein and xantham gum. Banza is not paying me to speak on their behalf, but they did send me six free boxes of pasta. I have been using this free pasta to experiment with different recipes. In all previous weeks I've followed a recipe, but this week I challenged myself to create my own. I was inspired by recipes I've tried in the past but decided to go completely off-book and create everything from scratch in the moment. 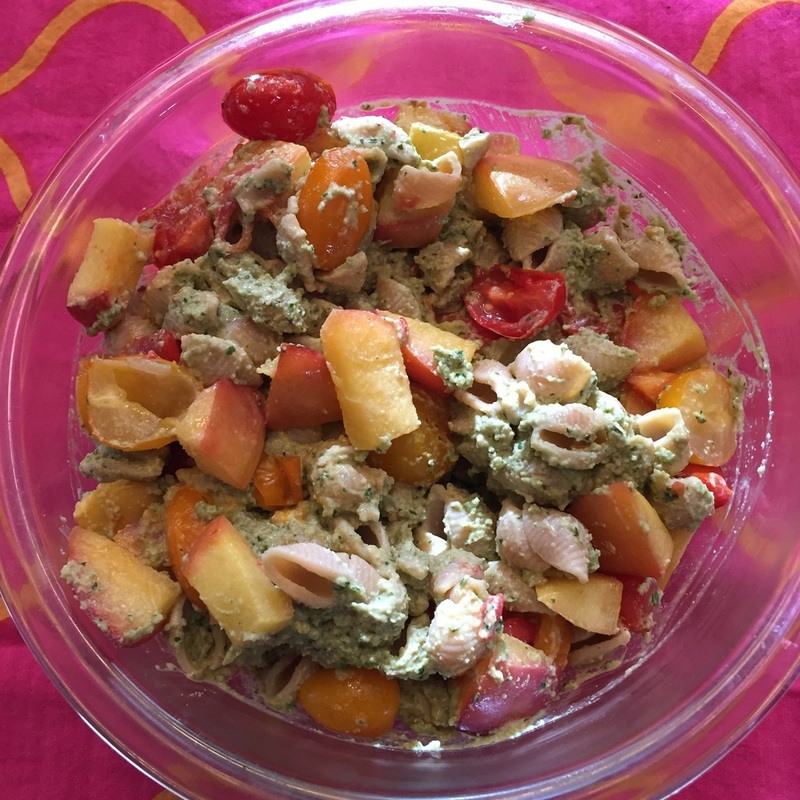 The result was a dish that has a creamy pesto sauce with a slight kick mixed with perfectly roasted savory tomatoes and sweet nectarines. To me this dish screams summertime. I ended up using about a third of the tomatoes pictured here, plus two of the nectarines. While the oven preheated to 325, I sliced everything up and placed on a baking sheet covered with tin foil. I sprayed everything with a little spray oil and sprinkled with a touch of sea salt. I baked for 15 minutes on one side, flipped everything over, and baked for 10 more. While those roasted, I assembled my pesto ingredients. 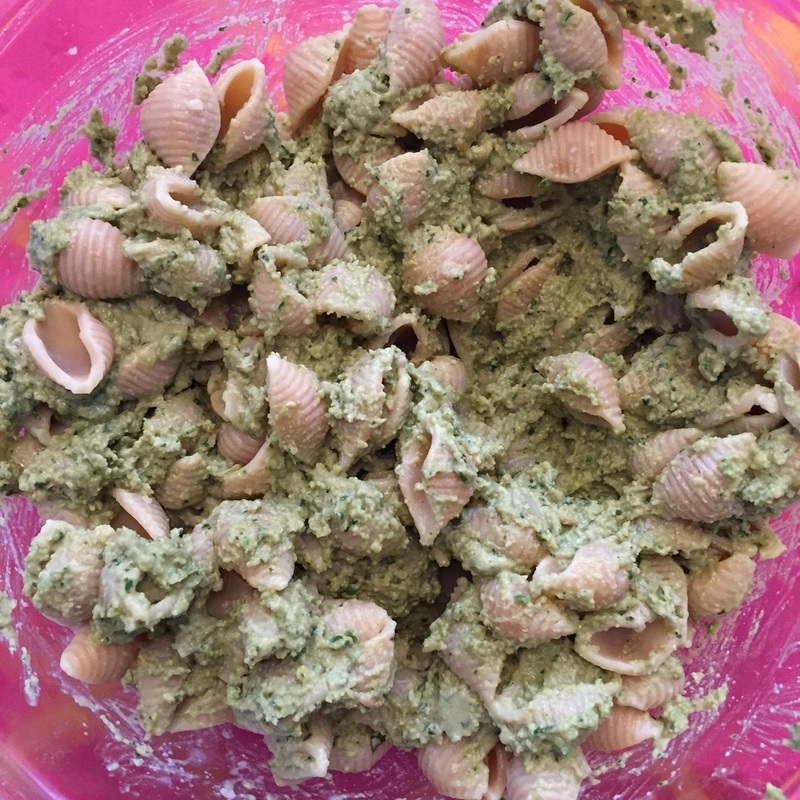 I used 1 cup of soaked cashews (which I started soaking a few hours prior), 1/4 cup nutritional yeast, 1/4 cup olive oil, 1/4 cup water, a package of basil, a clove of garlic, a sliced jalapeño, and salt and pepper to taste. If you're sensitive to spice, you could make this with either a deseeded jalapeño or leave the jalapeño out entirely. If you want to kick it up even more, add another jalapeño or choose a hotter style of pepper like habanero. For me, one jalapeño with all the seeds was perfect. There are few things I love more than throwing a bunch of ingredients into a food processor and ending up with something tasty. Making this thick, creamy pesto could not have been simpler. I know I mention this every time I make a recipe with Banza, but I again want to reiterate that it has the taste, texture and appearance of regular pasta. If you're nervous about a pasta made from chickpeas, rest assured there is absolutely no chickpea flavor. This just tastes like straight-up delicious noodles. I loved the hint of green that came out when I folded the pesto into the pasta, but I couldn't wait for the bold pop of color I knew was coming with the next step. I've been obsessed with roasted tomatoes all summer, but I think the real showstopper in this dish is the nectarines. A little sweetness in each bite makes this pasta refreshing and memorable. The whole recipe took about 20 minutes to make. It is packed with healthy fruits and veggies but does not taste like "health food." This dish got the seal of approval from my husband, who I don't think immediately realized that I hadn't followed a recipe to make it. For a quick, light summertime meal, I think this pasta is perfect.